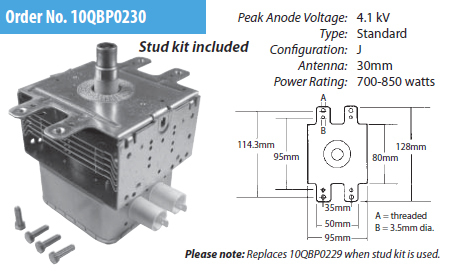 ERP 10QBP0230 Microwave Oven Magnetron. Direct replacement for DCS 212541, Sharp 2m53J(L), Electrolux 5303011673 5304408930, Whirlpool 8206341, W10216360, WB27X10089, W10210845, 4392008, 520225, PS373032. GE WB27X10370, 5304467693, WB27X10492, WB27X10475. Samsung OM75P(10)ERHN. For detailed cross reference click MORE DETAILS link. Includes mounting studs. Fits many models of Whirlpool, GE, Electrolux and Kenmore microwave ovens. ELECTRONIC PARTS ARE NOT RETURNABLE. SAVE HUGE $$$ OVER OEM WITH THIS ERP EXACT REPLACEMENT MAGNETRON!